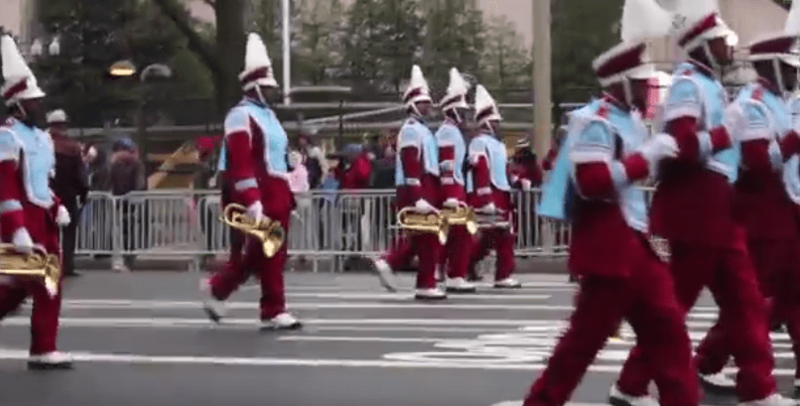 WASHINGTON (HUNS) — At Talladega College, a tiny historically black institution 55 miles east of Birmingham, Ala., the president, the administration, the band director and the school’s 230-member marching band are as giddy in anticipation as a 9-year-old a week before Christmas. In this case, however, Santa Claus, in the names of Donald Trump and his supporters and Fox-TV’s Bill O’Reilly and his millions of viewers, have already come to town and left the cash-strapped school $670,000 for marching in Trump’s inauguration. And now it’s time to go shopping. Visions of new trumpets, clarinets, Sousaphones, drums and trombones are dancing in their heads. There’s talk of a new band room big enough for all the members of the Great Tornado Marching Band to get in without stepping over each other. The college is even considering its own buses to get the band to performances at NFL games, the New Orleans Mardi Gras and the numerous other venues the band plays annually. The Great Talladega Tornado Marching band performs at the inaugural parade for Donald Trump despite backlash from HBCUs and alumni. “This has been an absolutely amazing ride,” said Greg Wilson, a spokesman for the college rode back to Talladega on the buses with the band. “What started out as a GoFundMe account just to get to D.C. to participate in the inauguration has morphed into something far greater. Probably no one is happier than Talladega President Billy Hawkins. “This is also a demonstration that we made the right decision to allow our students the opportunity to participate in a civic ceremony,” Hawkins said Tuesday. A little over a month ago, the college was the target of scorn nationally from activists and alumni for having agreeing to participate in the inauguration of a president-elect largely loathed by African-Americans. The band had applied to march in the parade long before the election, but when Trump won on Nov. 9 instead of Hillary Clinton and invited the band to participate, an avalanche of criticism engulfed the school. Shirley Ferrill of Fairfield, Ala., a member of the graduating class of 1974, told the Associated Press that she and other alumni were horrified to hear news of the school’s participation. She said didn’t want her alma mater to seem as if it was supporting Trump in any way. She created a petition asking for the withdrawal of the band from the inaugural festivities that gathered over 2,000 signatures. Poet Nikky Finney, a Talladega graduate and professor at the University of South Carolina, said she felt the band should not celebrate Trump. “The college had sold out the history of Talladega College for chicken change [and] maybe a tin star on a hatemonger’s parade route,” Finney told the New York Times. Much of that criticism was directed at Hawkins. “They’ve said that I have shamed the college by making this decision and have had folks to say I am a disgrace to my African-American race,” he said during a television interview before the inauguration. With such a furor, Hawkins considered pulling out, but decided to go after all. The band set up a Go Fund Me account with the goal of $75,000. In the beginning, there was a slight trickle, but after the college president appeared on the Bill O’Reilly show on Fox TV, the money flooded in. The college received $670,000 in the Go Fund Me account in a mere 15 days. The contributions were led by large donors. O’Reilly chipped in $25,000. Ophelia and Juan Roca, two Miami-based philanthropists, gave $6,000. That was followed by two anonymous donors of $5,000 each, then scores of four figure donations. More than 50 people gave at least $1,000. The donations were often accompanied by comments reflecting the donor’s support of Trump and O’Reilly. Edward Kinsey gave $500. “Your courage is an example of doing the right thing to support the United States of America,” Kinsey said. For the band and the school, the influx of cash has been a godsend. One third of the school’s 800 students participates in the band, officials said, and most of those students as well as at least half of the students on are some form of federal loans. He said he hopes to build on the school’s success, with alumni and others.